I cooked chane ka saag quite a lot this year. Somehow my demand for this particular leafy green met with supply too. I would keep asking the vendor at the corner of our weekly market for chane ka saag and he would say there are no takers here. May be he got a few more requests or just got fed up of me asking him every time I saw his other leafy greens, he brought it one day and then brings it more often. That's why I say we should create a demand for uncommon greens and vegetables too, the ones we used to get a decade ago are being forgotten with the flood of coloured peppers and imported vegetables. The desi produce is being forgotten sadly, I wonder if a large quantity of such produce rots while we eat the snow peas and coloured bell peppers, imported mushrooms and what not. Taste this wonderful leafy green that is a growing soft shoot of chickpea plant, the shoots are nipped to accelerate lateral growth of plant so it becomes more bushy and bears more fruit. I am sure chane ka saag will be bought often once you taste how good it is. I have already posted a few recipes. This one can be another way to have it. 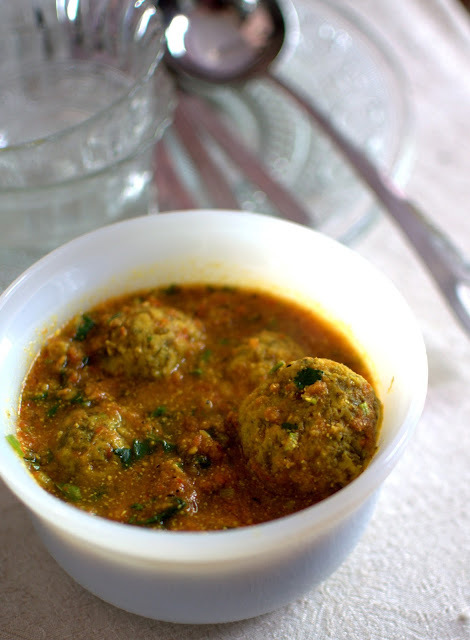 I love it as it is like a dumpling soup, it is great with plain boiled rice as well if you have some side dishes like alu ki bhujia or begun bhaja, the way it would be eaten traditionally. Mix everything from the list of dumpling ingredients and knead a dough. Make lime sized balls ans steam them. I microwave them in a greased bowl, covered with a loose lid and they get ready in 3-4 minutes. Check by pricking a cocktail stick if done. The detailed procedure of making these dumplings is mentioned here.You can follow the same steps and play with the flavors used in the dumplings too. Keeping the steamed dumpling in the fridge till cold will be good to get a better shape when cooked in gravy. Steaming them a day ahead makes sense. To make the gravy, heat the oil in a pan and tip in the fenugreek seeds. Let them become brownish taking care not to burn them. Tip in all the steamed dumplings into the hot oil and toss them gently so they get seared from all sides. Add the powders and toss the pan to coat everything and get a little roasted. Add the tomato paste and salt and about 2 cups of water and let the curry simmer for about 20 minutes. The dumpling balls will get doubled in size and the gravy will be lesser and thicker by the end of cooking. 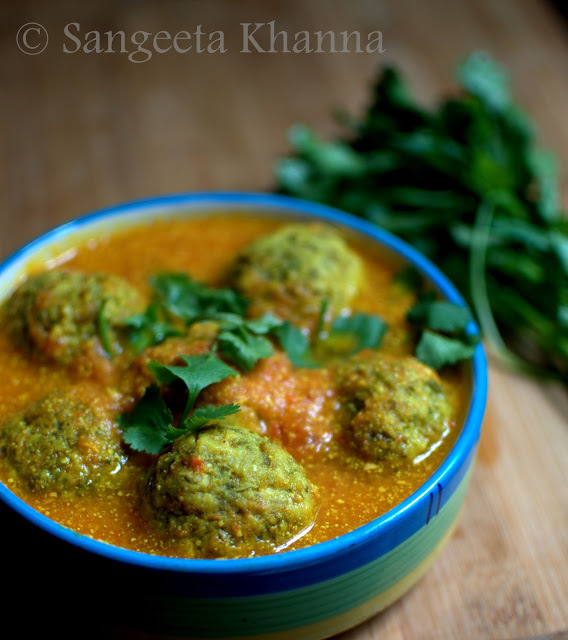 Garnish with fresh coriander greens and serve hot with hot boiled rice or just as it is. The version with a little garam masala looks darker in color and has more complex flavors. You can add some amchoor powder to balance the pungency of mustard if the tomatoes are not enough tart. You can also add a few shallow fried Okra to this curry, or small aubergines shallow fried. Even lightly fried potatoes work well into this curry. A mustard based masala curry is very versatile, We make besan katli ki subzi and sarson waali machhli in this gravy as well. A few variations can be done in the spice blend but it is essentially a pungent tart curry that goes well with besan based dumplings, most river fish and several vegetables. I am sure you would love this curry. 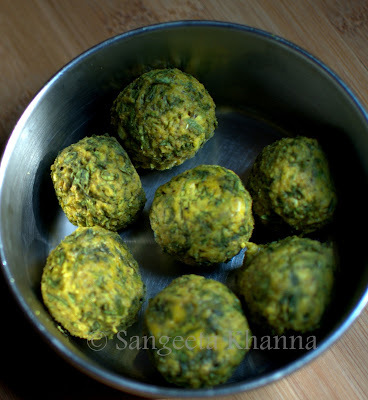 Spinach or dill greens can also be used if you don't get chane ka saag. Oh, that sounds (and looks) really tasty. I'd never be able to find chane ka saag here in the U.S, but maybe I could substitute another green leafy vegetable instead? Thanks Joyti. You ca always grow some chana in a pot. Kep it in any sunny place and keep pruning. You will get enough chane ka saag to make such treats occasionally. Sangeetha! Glad that you made that point! I am drooling for those ferns and the saag. Unfortunately this also points to the trap that many of us fall into in the bloggers world. Oh yes. You understand well Shri. All the imported vegetables are making the foodies go ga ga over them just for the looks. Blogs have only become dependent on pictures for some people and they don't even eat the food that is photographed sometimes. Blame all those rusty pots and pans used to photograph them, or the veggies used in raw form to click better pictures. Well, each one to it's own. i heart what you say. i did not know that bloggers don't even eat the food that is photographed.... lol... i find this so amusing. i would love to have chane ka saag, but cannot get it here. all i get are the other greens. may be i have to hunt in the local market for chane ka saag. Argh now you are killing me with these chane ka saag recipes! The season seems to be over here now that the hare chane themselves are available. Now I will definitely have to try this with dill instead as it looks too good to miss. ha ha.. Jenni I know you have be liking my Chane ka saag recipes..A hare chane ka nimona is on the way to this blog. Stay tuned. Thanks for the lovely feedback always. I couldn't wait any longer, so I made this for dinner tonight! Utterly delicious, the gravy is mouthwatering. I used dill instead of chane ka saag. I look forward to your hare chane ka nimona recipe. 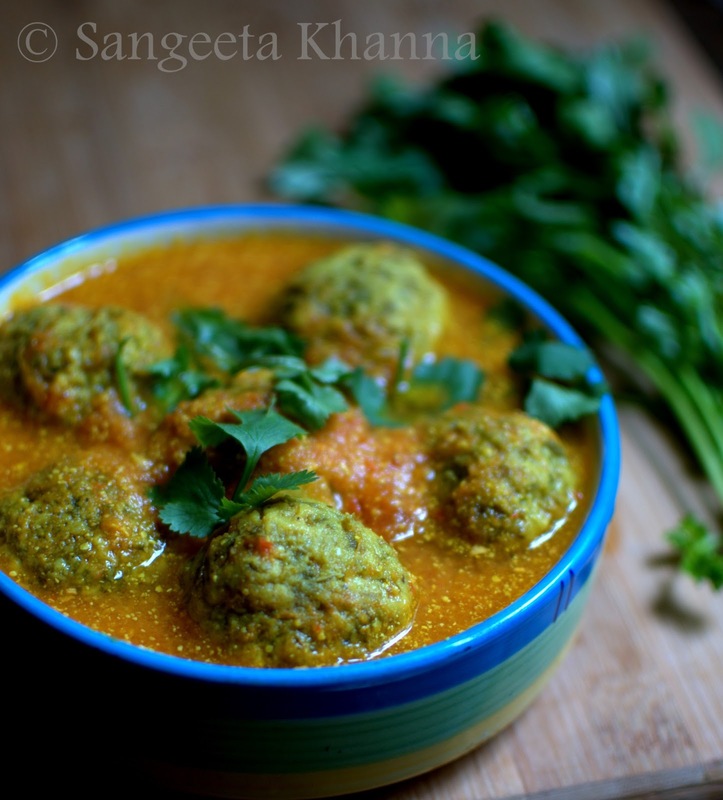 I make matar ka nimona and have been told I can make it exactly the same with hare chane, but have never tried it. I think it is because I am reluctant to blend the chane and lose their lovely texture. However, I think if you post a recipe I will have to give it a go. So interesting. Love the very idea of chane ka saag. Yumm! Wow. Ever so interesting. Love the idea of chane ka saag!